Why should my students become ASPA certified? Get ASPA Certified. Over a thousand printers and artists certified worldwide. It shows your expertise… Customers like to do business with people that they believe are competent. 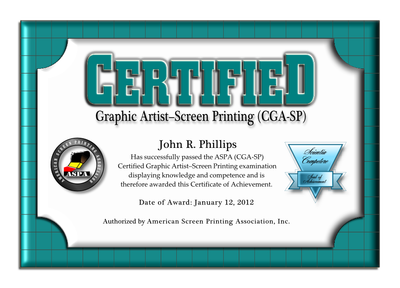 Screen printers who have earned ASPA certification have proven that they are qualified. Employers want qualified workers… Employers hire job applicants who have the qualifications that they are looking for. Job seekers that have been trained (and certified) at a trade have a better chance at getting hired than someone who knows nothing. As in most businesses, owners and managers of screen printing businesses would rather hire job applicants who are knowledgeable. Certification proves your knowledge… ASPA certification covers basic screen printing practices and procedures that every screen printer should know. Passing the ASPA certification exam requires a thorough knowledge of screen printing techniques, procedures, and the important aspects of the screen printing process. 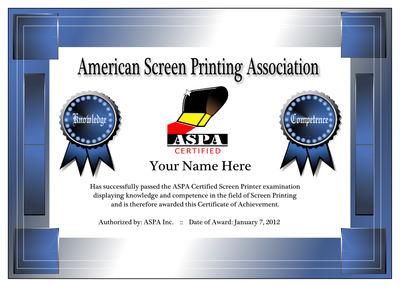 Professional recognition… ASPA certification recognizes and raises the professional status of screen printers by providing a standard of professional competence. Being recognized that you are a professional at your occupation is a source of pride and personal accomplishment for most people. Potential long term impact… Our certification programs recognize individuals who demonstrate competency and knowledge in the screen printing craft. Certification creates confidence and provides an opportunity to help a student secure employment. Our programs provides a sense of accomplishment and can bolster a student’s self esteem to help prepare them for the working world. Please consider the benefits… Take a few moments to review our certification programs. Enroll your school in the ASPA certification program today.